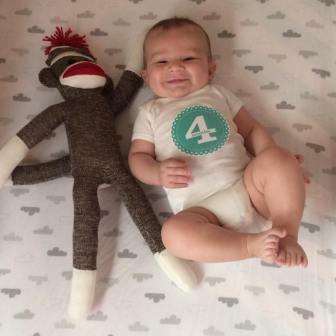 Dexter Ian is four months old today. His favorite things are sticking out his tongue, being the world’s most accomplished baby at resisting naps and waking up in the morning and babbling to himself while Matt and I lie in bed and giggle until one of us gives in and gets him out of his rocker. Dexter does this thing, you guys, where someone else is holding him and I’ll be talking and not paying attention and then suddenly I’ll notice his face and he is looking at me, grinning with absolute, unabashed delight. It knocks me out every time.